Past Indigenous Subsistence Practices in the Kimberley: a comparative approach. This project specifically looked at past Indigenous subsistence patterns focusing on the patchy, but unique rainforests that dot the Kimberley region (McKenzie et al. 1991). The project’s aim was to compare past Kimberley Indigenous plant and animal use with the Wet Tropics Bioregion in north Queensland (Cosgrove 1996; Cosgrove et al. 2007; Ferrier and Cosgrove 2010; Field et al. 2016) where it is believed that toxic plant and arboreal tree nut exploitation was a catalyst for the permanent settlement of the Wet Tropics region (Cosgrove et al. 2007). Recent research has suggested that this only occurred within the last 2,000 years because of increasing El Niño–Southern Oscillation climatic events (ENSO) that began 5,000 years ago (Cosgrove et al. 2007; Haberle et al. 2010). The theory is that people were able to occupy the rainforest permanently by exploiting novel and important new carbohydrate sources through the processing of noxious foods, particularly endemic arboreal nuts and ground tubers. Greater utilization of noxious nuts, poisonous tubers and cycad seeds increased the availability of carbohydrate and protein in Indigenous people’s diets. Having access to these products reduced the risk and uncertainty that accompanied resource acquisition during unpredictable climatic perturbations. Increasing use of noxious plant food led to a more predictable economy, albeit one that required considerable investment of time, energy and the development of new organic and lithic technologies to processes them. This effort was offset by the increased economic return rates that these foods were able to provide (Tuechler et al. 2012). The archaeological record in the Wet Tropics region indicates that human populations increased around this time, giving impetus to social and ceremonial activity, underpinned by a plentiful supply of newly acquired detoxified carbohydrate sources. This allowed for much larger gathering and longer periods of ceremonial activities within the Wet Tropics rainforest (Cosgrove 2006; Cosgrove et al. 2007). The aim of the present project was to investigate whether this model is applicable to the Kimberley region. In particular, it assessed whether similar increases in activity were underway in northwest Australia at this time or whether the use of these rainforest patches begin much earlier by focusing on a range of geophytes (tubers of perennial plants used for starch storage) such as those described by Veth (2016) and elaborately illustrated in the rock art of the region. Given that this region has been occupied for more than 40,000 years (O’Connor 1995), the results are likely to provide new insights into the use and tempo of plant and animal foods over the long term. Research team: led by Dr Simon Haberle [ANU], Dr Cassandra Rowe (Monash Uni), and Dr Ulrike Proske (ANU). Abstract: Despite the ecological and cultural significance of the Kimberley little is known about the long term history and variability of fire, vegetation and climate across the region. Key resources required to conduct palaeoecological research in the Kimberley have been developed in the form of an online pollen atlas (Kimberley Pollen Atlas). The discovery of pollen bearing sediment deposits that are at least 24000 years old in the Mitchell Plateau region will help us to develop a greater understanding of the role of fire-climate-people in vegetation dynamics and the maintenance of biodiversity over long time scales. Further exploratory work on the palaeoecology of wetlands is being conducted in the Broome and Kununurra-Wyndham region and a detailed analysis of pollen and charcoal in archaeological deposits from the Kimberley region is underway. Outcomes: The first online pollen atlas for Kimberley flora compiled. The discovery of pollen bearing sediment deposits that are at least 24,000 years old in the Mitchell Plateau region. Field work on internal drainage sites commended to provide data for integration with KFA’s Change and Continuity project. Status: Complete. Simon Haberle is now working on Environmental Transformations project. This project continues Prof. O’Connor’s initial research at Carpenter Gap which revealed evidence of human occupancy dating back more than 40,000 years. It should determine whether there is other organic material for dating in the caves and rock shelters, and whether there is potential for further excavation. If, as expected, there is an abundance of well-preserved, ancient organic matter [e.g. ropes, baskets, and other artefact remnants] and further excavation is physically feasible, Professors O’Connor and Balme hope to establish habitation dates that may push the time horizons back beyond those currently accepted. Extensive consultation with Indigenous representatives is integral to the success of this project. The project is intended to enable four PhD students to complete their research degrees. Led by Dr Karl-Heinz Wyrwoll (University of Western Australia) and Prof. Andy Gleadow (University of Melbourne). This project has established the long term climate record of the Kimberley region through field investigations and extensive dating of dune and flood events as well as the isotope analysis of stalagmite specimens from caves. This climate proxy record together with climate modelling experiments, including the feedback relationships between indigenous vegetation burning and climate, has provided a comprehensive understanding of the activity of the northern Australian monsoon and its controls over the last 60,000 years, and the environmental context for the early Kimberley inhabitants. This project was completed in 2013 and is currently in publication phase. However further climate modelling and analysis is being undertaken by Dr Wyrwoll in 2014. The KFA-sponsored Change and Continuity project has completed its 3rd and final year in the NW Kimberley. Chief investigators Dr June Ross and the late Prof. Mike Morwood talk to science writer Leigh Dayton. Rock art revelations. Scientific methods and Aboriginal knowledge are uncovering insights into the prehistoric settlement of northwest Australia. It may be older than the 40,000 year-old paintings in Spain’s El Castillo cave, the world’s oldest well-dated rock art. It depicts human-like figures, a motif exceedingly rare in the rock art galleries of Europe, famed for their depictions of ice age animals, hand stencils and circles. According to Morwood, little research had been done in this archaeologically rich region until three years ago. That’s when a project called Change & Continuity: archaeology, chronology and art in the northwest Kimberley began. He co-leads the project, along with University of New England rock art archaeologist June Ross and Macquarie University dating expert Kira Westaway. The multi-disciplinary group includes researchers from three universities and six graduate students. The project has approval from the Senior Traditional Owners from Wunambal Gaambera Country and Aboriginal rangers have developed skills in all aspects of the project. The goal is to blend modern research techniques with traditional knowledge, not only to enhance archaeological understanding of the past but to assist traditional owners manage their land and culture into the future. The work will provide essential information on the distribution, age and content of cultural heritage sites across the vast region. The 2012 field season wrapped up late July and data analysis is underway. “We hope to make a limited visit next year, tidying up and conveying the results to the local communities,” Morwood says of the team which receives major funding from the Australian Research Council and the Kimberley Foundation Australia, along with additional in-kind support from the WA Department of Environment and Conservation, the Kandiwal Indigenous Community and aviation firm Slingair-Heliwork. At the broadest level the Change & Continuity team seeks to document and date major turning points in the occupation of the Northwest Kimberley and answer fundamental questions. When did people first arrive? What impact did they have on local habitats and animals? How did they respond to climate changes? “It will take generations to unravel it all,” predicts Ross. But like her colleagues she says details are emerging by combining archaeological excavation and dating techniques with the scientific analysis of the styles, techniques, positioning and functions played by the rock art. Australian researchers have played a major role, along with French investigators, in putting rock art study into the mainstream of archaeology. Researchers worldwide now incorporate rock art into their investigations of prehistoric cultures. According to Morwood, they recognise that if they ask “the right questions” the art provides insight into the minds of people, not reflected in conventional artefacts. As Ross notes, there’s a trove of rock art to interrogate in the Kimberley, from paintings and engravings to stone arrangements. “Where there’s water there’s rock art. The sheer volume and sheer variety is striking”. The team has recorded 210 rock art sites in detail and visited many others, mainly in the Lawley and Mitchell River catchments. “There must be hundreds of thousands of paintings in the region”,says Ross. Imagine tall thin figures with tasseled belts, fancy headdresses and spears. Know originally as Bradshaws, after Joseph Bradshaw who reported them in 1891, these exquisite and highly detailed paintings are known now by their Aboriginal name, “Gwion”, and are an early regional style. 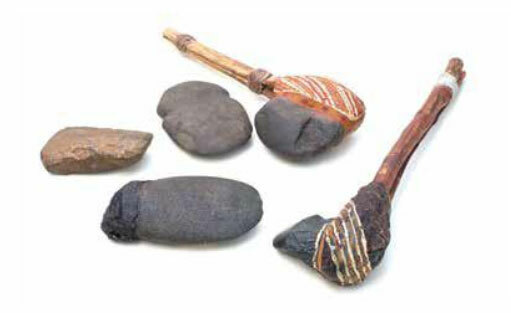 The most recent works, unique to the Kimberley, come from the “Wanjina” period. Here, round white faces with large carbon black eyes and dark halos around their heads stare from the rock. While it was argued by the late Kimberley rock art researcher Grahame Walsh that the two styles were so different, they must have been painted by people from different cultures, the new work shows otherwise. “What we’re finding is the changes are gradual,” explains Ross. “We see shared attributes on many figures,” she says. As with other KFA sponsored research, the transition over time from one form to another becomes evident. The team also sees artistic connections with the rock art of Arnhem Land to the northeast. And they’re confident information discovered during their excavation of seven rock shelter sites and three open sites near shelters will help establish how the people of the northwest Kimberley connected to those from the southern Kimberley. There, archaeologists have evidence of what may be a painted limestone slab dated to roughly 34,000– 43,000 before present. The critical task is to obtain more solid dates for the rock art and archaeological sites of the northwest Kimberley. To that end, tiny samples of ochre and other natural material – wasp nests, crusts and grains of carbon or sand – at the sites and above the art are being dated, using a variety of laboratory techniques. So when were artists putting ochre on rock? So far, the evidence Westaway and her geochronologist colleagues have obtained suggests the peak of Wanjina production was 1500 to 500 years ago. Abstract: Following the establishment at Lake Mungo of a long record of climatic change spanning the period of human occupation, a continental wide survey sought to identify the possibility of ‘other Mungos’ in the arid and semi-arid region of Australia. After extensive examination the most likely contenders were identified in the interconnected pattern of lakes within the Gregory Salt Lake system of northwestern Western Australia on the southern edge of the Kimberley. Proposal to carry out archaeological investigations of human occupancy of Mulan Lakes. Outcome: The discovery of an in-situ stone core lying 23cm below the top of the gravels was undoubted evidence of people of great antiquity associated with the desert environment during times much wetter than today. OSL dates effectively bracket the core age in the 40-50,000 year range, the first such evidence from this arid region of northern Australia. The unearthing of the 8cm core, although a single object of antiquity, is the oldest published evidence of OSL ages for occupation before the Last Glacial Maximum (Peter Veth & Jim Bowler). This project (excavations at Parnkupirti, Lake Gregory) was the first project KFA funded. Research team: led by Jillian Huntley, University of New England. Abstract: In Australia the use of ochre pigments has been a fundamental practice within Indigenous societies. The archaeological analysis of pigments provides tangible evidence of peoples’ connection to place, their country, and to each other through trade, exchange and social networks. This project, among the first in the world to systematically use Portable X-ray Fluorescence Spectroscopy (PXRF) on remote rock art sites, will examine processed pigments from rock art sites, unprocessed ochres recovered from excavated deposits, and other opportunistically derived archaeological and ethnographic samples (such as surface finds and ochre sources). Outcomes: Among the first projects in the world to systematically use Portable X-ray Fluorescence Spectroscopy (PXRF) on remote rock art sites. The results of in situ PXRF analysis are currently being compiled. Processed pigments from rock art sites, unprocessed ochres recovered from excavated deposits, and other archaeological and ethnographic samples have been examined. In situ and laboratory based analyses of the base rock matrix and mineral accretions have been undertaken in order to provide contextual information to the Messages in Paint Project and to specialist geochronologists Dr Max Aurbert and Dr Kira Westaway who are currently working on dating the rock art and archaeological deposits of the north-western Kimberley. Research team: led by Patrick McConville [ANU]. Abstract: The plan is to research the prehistory of the languages of the Kimberley and provide a database of the relevant findings. This will include linguo-genetic relationships between the indigenous languages of the Kimberley and elsewhere in Australia. It will also include evidence of language contacts and borrowings in the past, and partial reconstructions of the vocabularies of the proto-languages of the Kimberley. Hypotheses about prehistoric human ecologies and social organisation will be presented. Outcomes: Identification of languages and data sources; Database building and data analysis.